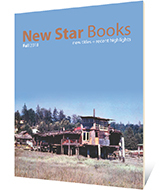 Carellin Brooks is the author and editor of several books and collections, including Wreck Beach (2007) in New Star's Transmontanus series. She is also the author of the non-fiction books Every Inch a Woman: Phallic Possession, Femininity, and the Text (2001), Fresh Hell: Motherhood in Pieces (2013), and, most recently, One Hundred Days of Rain (2016), which won both the 2016 Edmund White Debut Fiction Award and the 2016 ReLit Award for Fiction. A Rhodes Scholarship kid, Carellin Brooks holds a BA from McGill University as well as a doctorate from Oxford University. She lives in Vancouver, where she was born, and teaches writing at the University of British Columbia.